When I was a kid in Chicago, Memorial Day was the day you got out of school...and then you had to go back for another week. Frequently a parade was involved. In the South, I learned that Memorial Day was "invented by the Yankees." Memorial Day really was begun to commemorate the Union Army dead. Back South, we were taught that this was not the real Memorial Day. The real commemoration day was Confederate Memorial Day, which was sometime in April. The only thing important to me was that we didn't get a day free from school for either Memorial Day. As a teacher in Another Part of the South, the school year usually ended on Memorial Day, which meant the faculty was still working. By the time you had handed out report cards, packed up your classroom, and argued with a few parents over grades, my only thought was :Oh boy, two and a half months off." Not counting a week of inservice and a week that I had to chaperone a trip to cheerleading camp. School has bee out a week already here in Atlanta. Some how my life hasn't become any less full; school year responsibilities are replaced by summer activities. As JoAnn said in her last post, this is a time of transition. But even among the flurry of end-of-school-beginning-of-summer activities, I hope to spend part of the day reflecting on the true meaning of this holiday. (It comes as a surprise to my daughter that Memorial Day was not created for "Memorial Day Mall Madness" sales!) To me, the true theme of this day is "sacrifice and service." Two words that I don't hear much about these days. That is what I will be thinking about today; Americans present and past who have served out country in peace as well as war. My daughter will also probably coerce me into taking her to Mall Madness, as well. I was one of thirteen guest Illinois children’s books authors, illustrators and storytellers invited to participate in the 36th Annual Illinois Young Authors Conference held May 15 at Illinois State University in Normal. Co-sponsored each May by the Illinois State Board of Education, the Illinois Language and Literacy Council and The Illinois Reading Council, the event celebrates and honors exceptional writing by students in grades K through 8. More than 500 students and their families traveled up and down and across Illinois to participate. A pre-conference informal Friday night gathering at the Illinois State University Barnes & Noble Bookstore featured a panel discussion and book sale. Saturday’s sessions are the true treasure. Young writers from similar grade levels meet in small groups facilitated by parent and teacher volunteers. The students read aloud their manuscripts, share their writing process, then connect, writer-to-writer, with their assigned children’s book author. Beth Vest of Lacon and Andrea Miracle of Edwardsville proved invaluable during my three sessions with third and fourth graders, overseeing my materials, clocking my talk and furiously copying the quickly-crafted original wording of each session’s group-written List Poem verse that appears, complete, at the end of this posting. The day ended with an Awards Ceremony during which each participating Young Author received a certificate and autographed book from his or her session author. Hats off (stove-pipe style) to Jan Dundon who once again so generously gave of her time to organize and oversee this singular annual Illinois event, and to her hard-working ILLC and IRC volunteers..
And hats off, too, to the talented Young Authors honored at this year's 36th Illinois Young Authors celebration! Another talented Illinois author, known especially for his oration, would be stroking his beard and popping his black vest buttons. The Land of Lincoln grows some mighty fine writers! No one, it turns out, wrote a memoir. But Gillian wrote about her brother in the service. All agreed: each wrote something unique. Michael loved the drawing and the coloring. Ryan loved thinking about something, then simply just writing. Aziz liked sharing thoughts and Life experiences. “You can redo writing if you want to,” said Hunter. Jack Timbo likes writing a lot of stuff on paper. 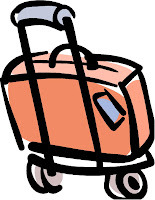 My husband's bags are packed. This morning he leaves to spend three days in the great outdoors with 150 sixth graders. When we told our daughter about his impending trip, she cried for several hours. The next morning she asked, "Is Daddy going because he HAS to go? Or because he wants to go?" Well, a little bit of both. And isn't that how it is with so much of what we do? Thanks to our bizarre winter weather, my husband's school district doesn't celebrate its Last Day until June 23rd. As the fourth marking period began a mere two weeks ago, my husband said, "They're done." A spate of spitting and binder-clip-throwing incidents this week has proved his point. A change of pace and scenery will do everyone some good. My husband's district has changed its curriculum substantially in the last few years. Reading and interpreting novels has been discouraged (except as a supplementary activity) for on-grade-level readers. Most of the instruction is aimed at "reading to perform a task" (and pass a test). Does this trend sound familiar to you classroom teachers? Being a creative type, my husband tries to incorporate song lyrics into writing assignments in order to draw out his middle school musicians. A recent research project involved designing travel brochures for summer destinations. Thinking ahead -- to summer and beyond -- is always a good end-of-year theme. On the other hand, my end-of-year activity for English 101 students is typically a boring (but necessary) portfolio review. Which was your strongest paper? What did you learn this semester? What do you wish you'd learned? What did you like about this class? Of course the students are being graded on this assignment, so I rarely get honest answers about what they didn't like. I'll have to work on that one, because I really do want to know! It occurs to me that a really good end-of-year activity might synthesize the forward-looking and backward-looking inclinations into one assignment. My daughter is "graduating" from preschool next week, and I must admit to feeling ridiculously sentimental about this passage. My 3-year-old son is simply graduating from one room to the next, and I feel almost almost as freklempt that wonderful Ms. Liz and Ms. Kim will never teach a Ford child again. I ask my students in their research essays to write about how they'd like to change the world. This is a daunting assignment for many. Some ignore this aspect of the assignment and simply research a topic of moderate interest to them, such as legalization of marijuana (a very popular choice!). But then I will get the essays that move me to tears -- the student who wants to be a dentist serving kids with special needs because her brother has autism and could never find adequate dental care; the student who has struggled for years with an eating disorder and wants to spend her career working with girls in similar situations. Ellen Hopkins, author of Young Adult novels in poems Fallout, Tricks, Identical, Glass, Impulse, Burned, and Crank, uses interesting alignment in her poems. They are often layered, allowing the poem to say more than one thing, as if she were writing two poems at once. I've wanted to play with this form for some time. So let's write a poem about the end of the school year! 1) I flipped through my school year calendar, thinking about what happened each month. Then I jotted down five events that brought up strong emotions. 2) I chose one of the memories. 3) I constructed a simple sentence (for the right side) that conveys some of what I wanted to say. 4) I wove the words of this short sentence into the stanzas on the left side. 1) The pre-launch very first-in-the-entire-world reading of New Year at the Pier on the beach at sunset—I was scared, it was cold and there weren’t very many people at the event (Can you blame them? It was freezing!) 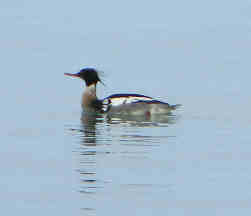 See photo above. huge—at least a hundred people. if they could hear me over the waves. child with dark curls sat right in front. I focused on her. I read the story as thexxxxxxxxxxxxxxxxxxxxxxxxxxxxxxxxxxxxxxxxsun set. When you have a poem you like--ta-dah! Waving your poem in the air, run, don't walk to someone who loves you and ask him or her to read it. And then? 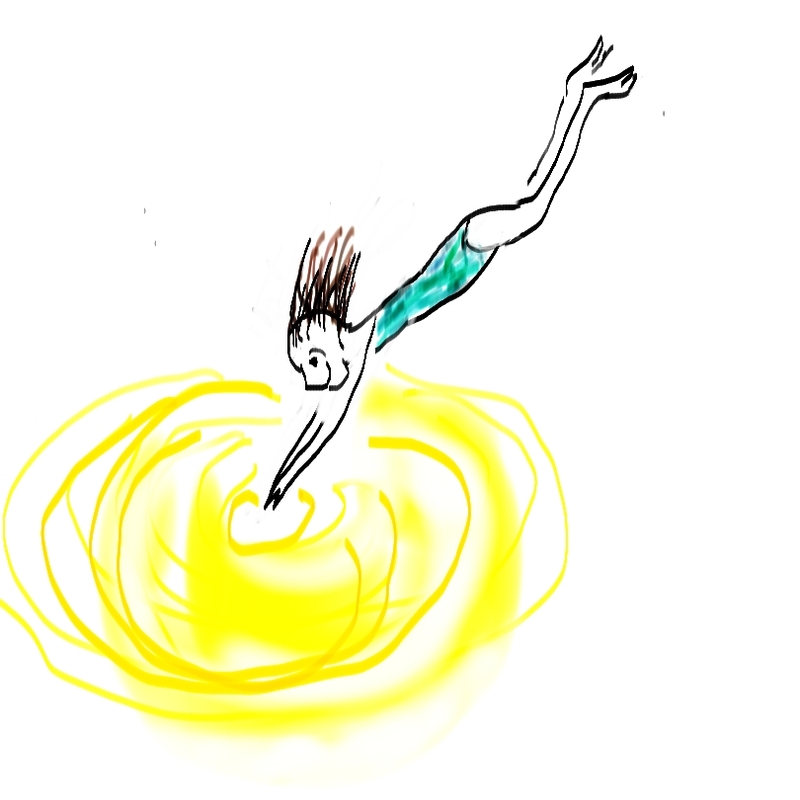 Dive into summer! Here in the United States, the school year is drawing to a close. Around this time last year, we received an Ask the TeachingAuthors question about end-of-the-school-year writing activities. Unfortunately, we weren't able to address the question in time. To make up for that, we'll be providing a series of end-of-the-year Writing Workouts this week and next. If you're a teacher, you'll find the first below. If you're a writer, this may be the time to look ahead and think about how summer will affect your writing schedule. Summer is a very productive time for some writers. Many of my adult students are teachers and librarians who look forward to summer vacation as a time to catch up on their writing. Not for me. Maintaining my writing routine during the summer months is often a challenge. When my son was young, the challenge was not to let my writing interfere with his summer activities, and vice versa. Now that he's grown up, that's no longer an issue. But teaching has become one of my summer activities. I teach several week-long writing camps for young writers, along with adult classes. I love teaching, and I'm always revising and fine-tuning my camps to keep them fresh and fun for my young students. That takes creative energy, as well as time. I'm not complaining. It's just something I need to allow for when I set my summer writing goals. I'd love to know how other writers deal with this seasonal transition. Will the end of the school year affect your writing schedule? Does taking a vacation refresh you as a writer or do you feel you've lost your momentum and have to start over? Do you have any tips on staying creative during the lazy, hazy days of summer? Please share your ideas via our comments. And don't forget: today is the last day to enter our giveaway drawing for an autographed copy of April Pulley Sayre's picture book Turtle, Turtle, Watch Out! See JoAnn's last post for details. How much can you read in 48 hours? Why not sign up for the MotherReader: Fifth Annual 48 Hour Book Challenge and find out. It's a great way to kick off the summer reading season, and maybe even win a prize! I'm hoping to participate for the first time this year myself. Want to read an authentic, compelling teen voice? Check out Steph Bowe's Hey! Teenager of the Year blog. Bowe is a sixteen-year-old whose debut novel, Girl Saves Boy, will be published in Australia and New Zealand this September and by Egmont USA in 2011. If you are a young author, or know someone who is, you'll be interested in her post "Does Age Matter in Publishing?" If you need help with issues related to social media, be sure to visit Greg Pincus' The Happy Accident blog. This week he blogged about "Three Ways to Help Protect Your Facebook Privacy." Create a 5 x 7" postcard from your fantasy vacation destination. On one side, draw a picture of the fun activities you're enjoying on your vacation. On the other side, write a description of your amazing vacation. Write a letter to yourself that begins: Next fall, one thing that will be different is . . . If this is for your students, you can have them bring in self-addressed stamped envelopes for their letters. Then be sure to place the letters in the mail on the first day of fall, which is September 22 this year. If the letter is for yourself, attach it to the September page of your calendar, and don't read it until then. April and Jeanne Marie will share additional end-of-year Writing Workouts in their upcoming posts. If you have an activity that works well with your student, please share it by posting a comment below. The last time I posted I was on my way to Chicago for the One Book Two Villages Program (hence known as OBTV), hosted annually by the Winnetka-Northfield Public Library System. Each year, two thematically related books...one for children, one for adults...are selected for citywide reading in Winnetka and Northfield. 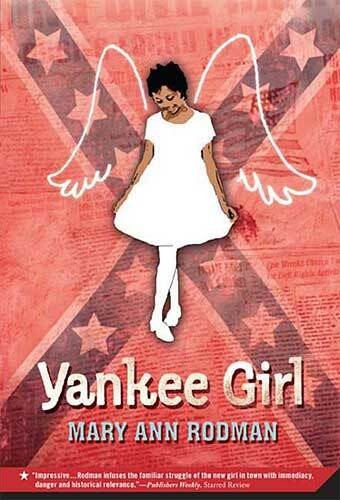 This year, my middle grade historical fiction Yankee Girl was chosen as the children's book. If knowing that your adult counterpart is a bestseller was not intimidating enough, I really felt out-of-my-league when I learned that my predecessors in the program include Laurie Halse Anderson, Pam Munoz Ryan and Deborah Ellis! Luckily, I didn't come upon that information until after the first day of the program. By that time I already knew that the readers and librarians of Winnetka-Northfield Public are the best. I have never had more fun on a multo-day school/library presentation. Because this program has existed for seven years, the whole three days were smooth, glitch-less and stress free for me. after awhile you know you have been asked every conceivable question. . . twice! These students questions I had never considered, and found themes and nuances I was unaware of. . .and I wrote the book! Many of these students were also present for a Mother-Daughter Book Dicussion and Young Writer's Workshop that took place at the Winnetka Library after school. By the end of day two, I could remember the names of a dozen kids, because they had attended both programs and at been present for one of the school visits. If all this activity were not enough, there was a booksigning and talk at The Book Stall in Winnetka. Not only did I see the same students from the other programs, but for me, there was a special surprise. The brother of one of my father's FBI partners showed up! I had never met this man before, but his resemblance to his brother (who I knew very well) was so amazing, I knew exactly who he was before he introduced himself. The last event on my agenda was a luncheon with the Winnetka Alliance for Early Childhood. This time I gave my "adults only" version of the actual events behind YG. I had a great time; I hope my audience did as well. I would like to thank every single person who made my time in Illinois so special. . .but I don't know all of their names. A big shout out to those school librarians and teachers for spending considerable time discussing YG in advance. A thank you to the folks at the Book Stall, and the Winnetka Alliance for Early Childhood. Roses all around to everybody at the Winnetka Library (especially Director David Seleb) who became my new BFF's overnight. Most of all, I want to send a truckload of (cyber) roses to the Wonderful Wizard of Winnetka, Head of Youth Services, Bronwyn Parhad who made all of this come to pass. That's Bronwyn with the OBTV display in the library's children's department. Hooray for Bronwyn and Winnetka-Public Library for giving me the best gift a children's writer can receive . . . the opportunity to connect with young readers. you can see how much fun we had. Browym and her PR team also produced this terrific YouTube trailer for the Yankee Girl part of the TVOB. Just enter my name in a video search, and it will come up. Book Giveaway and Guest Teaching Author Interview with April Pulley Sayre! The Teaching Authors are happy to present an interview with our good friend and Guest Teaching Author April Pulley Sayre. 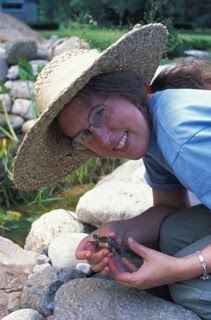 April Pulley Sayre is the award-winning author of over 55 natural history books for children and adults. Her read-aloud nonfiction books, known for their lyricism and scientific precision, have been translated into French, Dutch, Japanese, and Korean. She is best known for pioneering literary ways to immerse young readers in natural events via creative storytelling and unusual perspectives. 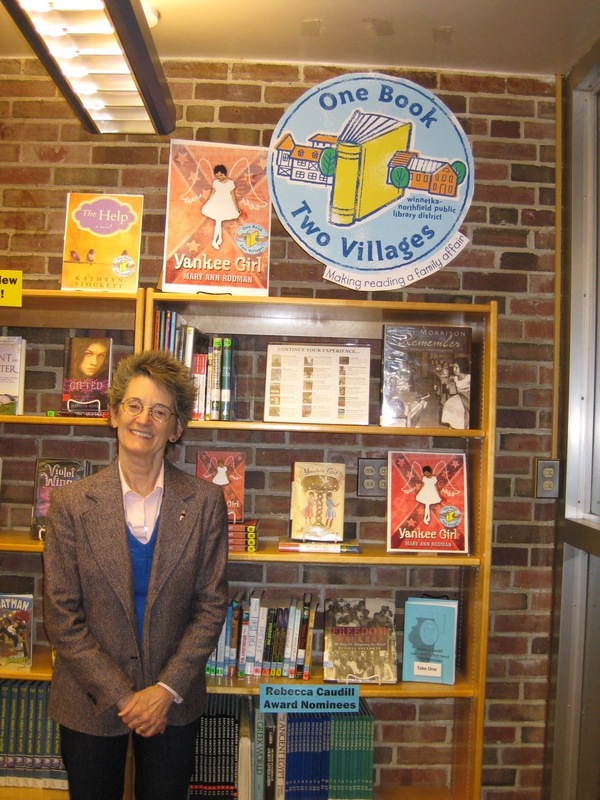 In 2008, Sayre accepted the Theodor “Seuss” Geisel Honor Award given by the American Library Association for her book Vulture View. It was also named a finalist for the 2008 AAAS/Subaru SB&F Prize for Excellence in Science Books. Stars Beneath Your Bed: The Surprising Story of Dust won the 2006 AAAS/Subaru SB&F Prize for Excellence in Science Books and was named a 2006 ALA Notable Children’s Book. One Is a Snail, Ten Is a Crab was a 2004 ALA Notable Children’s Book and a 2003 Bulletin of the Center for Children’s Books Blue Ribbon Book and received Britain’s highest literacy award. Dig, Wait, Listen: A Desert Toad’s Tale was a Riverbank Review Children’s Book of Distinction and a 2001 ALA Booklist Editors’ Choice and received starred reviews. The Bumblebee Queen marked April's third win of the John Burroughs Award. Sayre has followed lemurs in Madagascar, pursued army ants in Panama, and eaten piranha in the Peruvian Amazon. She and her husband, native plants expert Jeff Sayre, love science and adventure. 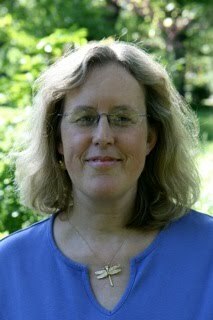 Sayre is an expert speaker in the fields of writing, science education, children’s literature, and wildlife gardening. 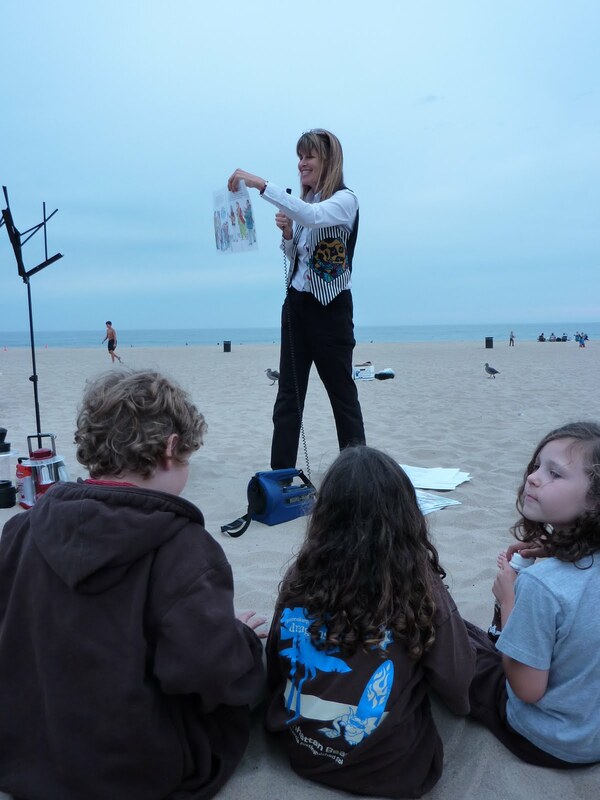 Each year, she speaks to over 15,000 students nationwide, introducing them to the writing process, the joy of words, the diversity of rain forests, and wacky things scientists do to find, follow, and study animals. To celebrate April's appearance on our blog, we're giving away an autographed copy of her new book Turtle, Turtle, Watch Out! To enter the drawing, see the instructions at the end of this post. Welcome, April! How did you become a Teaching Author? My work as a teaching author came after publishing dozens of books and earning an M.F.A. in creative writing for children and young adults at Vermont College. By speaking to over 15,000 students each year during school visits nationwide, I learned how to communicate my writing process to students. Along the way, educators shared what they were doing. I found ways to meld my 20 years as a writer with what teachers needed. Now, I teach educators and aspiring adult writers at conferences, workshops, and inservices. Because of my travel/speaking schedule, I do not take on semester courses. What is a common problem or question that your students have, and how do you address it? Lots of my students have good ideas, great heart, and moments of beautiful language. What they need is compelling, dynamic structure. They need to fearlessly experiment with structure. Sometimes one has to break and remake a book to find the right structure. Many writing students haven't thought enough about structure, particularly creative nonfiction structures. Although I teach fiction writing, even novel writing, most students look to me to bring their nonfiction to the next level of quality. For this, I have specific exercises to help students enliven their nonfiction. For instance, I have kids brainstorm and reach farther with their comparisons. Comparisons insert an image into writing. They impact how a reader feels. Comparisons can give readers a sense of scale. For example, you could write: "An adult loggerhead is big." But that's not specific or illuminating. Giving the exact weight helps make it more interesting. But even better is having the exact weight plus a comparison. Instead of saying an adult loggerhead is big, you could say: "An adult loggerhead turtle weighs as much as a refrigerator full of food." I had to call a moving company to find out the weight for that comparison. How does your love of science and nature inspire your writing? My life is infused with science and immersed in nature study. I read science magazines and watch science shows. I scan scientific articles and news tidbits on the web. My husband and I study plants and animals at every break we have in the work day and on each vacation. We travel to hike rain forests and snorkel coral reefs for research, but even the common animals in our neighborhood teach us. Writing flows from the wonder and humor we find in the everyday world. 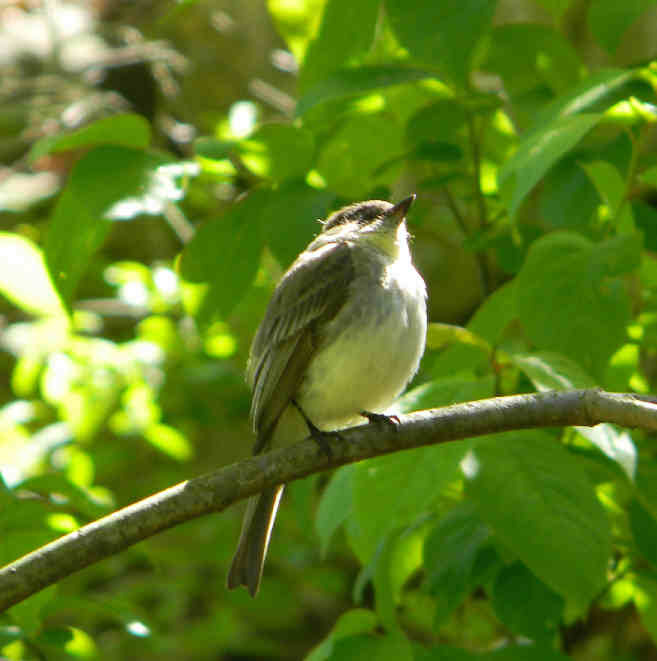 Of course, our everyday world is squirrels, hummingbirds, and bumblebees in a 400-species native plant garden and an ever-expanding vegetable garden! Teachers use my books to teach creative nonfiction structures and devices such as alliteration and onomatopoeia. On my web site, I have hundreds of accounts of what teachers do with my books. These are searchable by educational terms and content areas such as birds, fish, trees, onomatopoeia, and so on. My work is also indexed on INK Think Tank, a free database of high quality nonfiction books correlated to national standards in math, science, social studies, etc. Kids love to read nonfiction. But many of them haven't seen enough different kinds of nonfiction to appreciate the wide range of structures for writing about the real world. My books serve as a model for both narrative and expository writing. Really, it doesn't take much to get writers, young and old, fired up about nonfiction writing once they see how creative and joyous this work can be. Another great thing is that teachers can now use me, in addition to my books, in the classroom! I'm part of Ink Link: Authors On Call, which is offering an entire slate of award-winning nonfiction authors to schools and districts for teacher training via high videoconferencing and webinars. I also do school visits/classroom drop-ins via Skype and iChat. I encourage anyone interested in writing or teaching nonfiction writing to regularly read the Interesting Nonfiction for Kids (I.N.K.) blog. Can you tell us about the moment you knew you were a writer? My husband actually took a photo of the moment I knew I was a writer. I was sitting by a stream in a rain forest in Madagascar in 1990. This was a stream where a little warbler sang, a warbler which someone else later identified as a new species. It was a stream where we bathed and watched malachite kingfishers and found an amazing tarantula-ish spider on a rock. I was writing in a notebook after a long day following lemurs as part of a long term study of their behavior by my mentor, Patricia Wright. I was joyously, deeply in flow, that drilled down, one-with-the universe feeling that you have during inspiration. I was taking notes for an article about the wild life of scientists. I knew that I no longer wanted to do the science; I wanted to write about the science and scientists, and about the non-scientific part, such as the deep and mysterious connection between the Malagasy people and the "ancestors," as they call them. Here's a deep exploration for writers. I use this with adults who are trying to break through in their creativity. It's from my book Unfold Your Brain. 1. Explore the underpinnings of your life. Draw yourself as a home with foundations, pipes, and wires for your inflows and outflows: of water, energy, food, inspiration, money, love, health, joy, pain, stress, comfort, and whatever else flows through your days. 2. Now write about one or all of those underpinnings and what you have found through drawing. Note to readers: Unfold Your Brain: Deepen Your Creativity, Expand into New Arts, and Prosper as a Writer, Musician, or Visual Artist is available at Lulu. Thank you for joining us, April! Readers, before entering our contest, please read our Book Giveaway Guidelines. 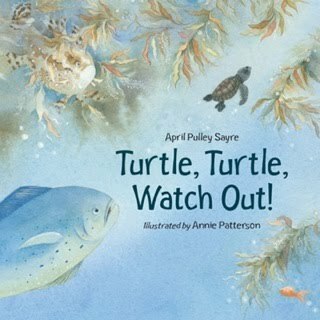 For a chance to win an autographed copy of April Pulley Sayre's Turtle, Turtle, Watch Out!, post a comment to today's blog post telling us about a turtle experience you've had on land, in the sea, or in a classroom. To qualify, your entry must be posted by 11 p.m. Wednesday, May 19, 2010 (Central Standard Time). The winner will be announced by 11 p.m., Thursday, May 20, 2010. April's web site includes photos of turtle activities, including sea turtles made out of paper plates. We look forward to reading your turtle comments. Good luck! What better way for this children’s book writer to celebrate Children’s Book Week than to capture the event’s heart in a Zeno poem, the original poetic format shared last Friday, May 7 in my fellow TeachingAuthor April Halprin Wayland’s post. Sponsored by The Children’s Book Council since 1919 (!) and administrated by Every Child a Reader, this year’s May 10-16 celebration includes a bounty of brand-new events and initiatives to accompany the third annual Children’s Choice Book Awards. The CBC is partnering with a bookstore in at least 10 cities to stage CBW events, including Atlanta, Chicago, Houston, Minneapolis, San Jose and Philadelphia. Former Children’s Book Ambassador Jon Scieszka and current Ambassador Katherine Paterson appear May 10 at the Barnes & Noble at 86th and Lexington. To learn what’s going on in your neck of the woods, check CBC Online. CBW receives a boost from a first-time TV partnership. Lifetime's The Balancing Act hosts a different author every morning from May 10-14, including Scieszka, Johnette Downing, Barbara Bottner, Jo Nobisso, and Carol Nevius. 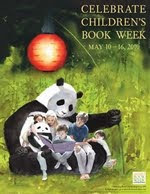 The online website offers all sorts of fun, meaningful ways for teachers, librarians, booksellers, parents, writers and of course, last but not least, young readers to celebrate children’s books and the wondrous book selections available to kids this week, May 10 through 16, but any week, any month, any year, every year. 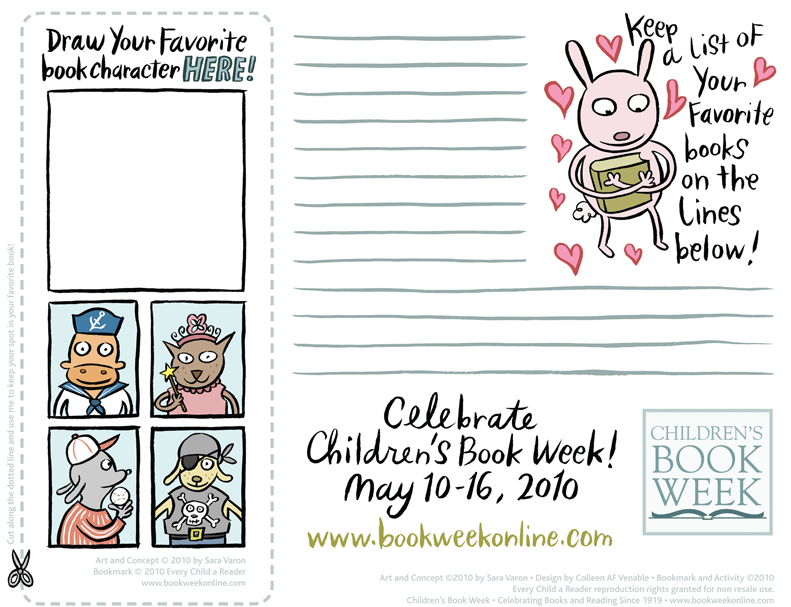 Share how-to instructions for making Children’s Book Week bookmarks. Check out the downloadable Children’s Book Week Crossword and Word Search puzzles. Be sure to also check listings for your local libraries, local booksellers and local community events. 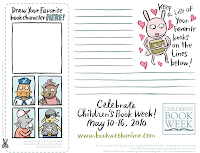 And, don't forget Jeanne Marie's Monday, May 10 Writing Workout link to the Children's Book Week Story Starters created by National Ambassador Katherine Paterson, Eoin Colfer, Barbara Park, Lemony Snickets and others. Mo Willem's contribution starts a short comic story titled "BLAM!" His opening line? "DUDE! DID YOU HEAR ABOUT THE NEW TEACHER?" We remember our First Kiss, our First Love, our First Job, our First Sale. What about our First Children’s Book? Think back on the children’s books that made you a reader and thus made you a writer. Track down your very favorite – on your own bookshelf or on the bookshelf of another, in a basement or attic box, at your local library or bookstore. Turn the pages, remembering who you were the first time you heard the story. If possible, read the words out loud. YOU, of course, have changed. But has the story and its telling? Has its place in your heart? Now, try your hand at writing a Zeno poem – one that celebrates the character, pays tribute to the story or simply acknowledges the deliciousness of the reading experience. Here are April Halprin Wayland’s instructions. B) Spill memories about this topic on paper. C) Choose one of the memories. D) Decide on the one-syllable word on which you’d like your poem to end. E) List at least three one-syllable words which rhyme with the word you chose above and which could somehow be related to your subject. Find the rhymes by using your noodle, opening up a handy rhyming dictionary or using one online. I was just putting my daughter to bed and asked her, after she'd begged for yet one more story, why exactly she likes to read. Apart from the obvious answer (stalling bedtime), she had to ponder for a bit. Finally, "I'll have to think about it and answer that question tomorrow." Hmm. So much for asking the experts! What kind of stories does she like? "Nice stories. Where people are nice." Meantime, my three-year-old tonight demanded for the first time, "Put down your computer, Mommy." And, when I was too slow to comply, he bopped me in the head with a ping pong ball. Didn't he know I was writing a story just for him? So much for Mother's Day! Writing (and selling) children's books is a uniquely challenging endeavour, let's face it, because our audience and our consumers are not at all the same. Editors are not children. Parents are not children. Our books must appeal to both these groups of gatekeepers before they can get into the hands of the children who will devour them (or not). What were your favorite books of childhood? Do you still love them? What are your children's favorites? How much do these categories overlap? I like to think that I have tasteful children, but for every Jane Yolen or Carolyn Crimi that I relish reading aloud, there's some dreadful novelty book complete with finger puppets that is in equal demand. Do you ever secretly suspect that Henry Huggins or The Moffats could never be published today? I love episodic books, quiet books, character studies, humor. Apart from humor, there's not a lot of cachet in any of those categories today, is there? What I especially love about Children's Book Week, of course, is that kids get to vote in their own version of the Newbery Awards. Of course, their participation is still entirely dependent upon the adults who love them, and the adults who love books -- us! For those teachers among us, check out these awesome story starters! Howdy! Happy Poetry Friday! Today's poem and your Poetry Writing Workout are below. But hold on...there’s A LOT going on this week, including National Picture Book Writing Week, Mother’s Day, and Teacher Appreciation Week! I can relate to those who are writing a picture book a day for a week. I took the National Poetry Month Challenge this year, writing a poem a day (many are birthday poems) for the month of April. I'm not sure if I'd call that a challenge...or insanity. who interviewed J.Patrick Lewis, the inventor of Zeno poems. According to Pat, a Zeno is a 10-line verse form with a repeating syllable count of 8,4,2,1,4,2,1,4,2,1. The rhyme scheme is abcdefdghd. A) Pick a topic. I wanted to write about teachers and why I appreciated them. B) Spill memories about this topic on paper. I wrote about Mr. Campman, my 10th grade biology teacher; about my father—how no question was a bad question, how he was always engaged and focused when taking about science with me; about my mother—how she helped me learn a violin piece and coached me for the Shakespeare competition; about my poetry teacher, Myra Cohn Livingston—how we rose to meet her very high expectations; about Professor Willis, who on a dare, taught all of Western Civilization in one quarter—the best college class I ever took. E) List at least three one-syllable words which rhyme with the word you chose above and which could somehow be related to your subject. Find the rhymes by using your noodle, opening up a handy rhyming dictionary or using this one online. 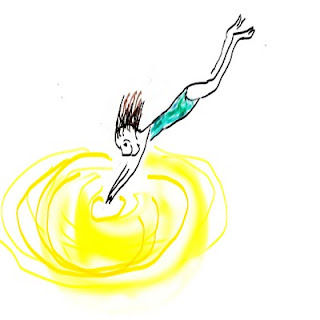 7) Get down in your mud puddle of form, ideas and words—and play! I changed my rhyming word several times. In fact, I'll show you three versions of the same poem. You can tell me at the end which one you liked the best. For walking into class on fire. Which version did you like best? ...and Happy Mother’s Day to ALL of us...and to my mother in particular. A child comes home from his first day at school. The child replies, "Not enough. I have to go back tomorrow." This joke is courtesy of the Teacher Appreciation website. In addition to teacher/student jokes, the site contains ideas for showing our teachers how much we appreciate them. 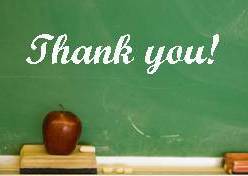 Please don't let this week go by without saying "thank you" to a teacher. This post is later than usual for me because I spent the morning visiting Union Ridge Elementary School in Harwood Heights, IL. The students were so attentive and enthusiastic, and they made me feel very welcome. Thank you, Huskies! And I have to commend and thank the teachers and staff at Union Ridge for celebrating their marvelous young authors. I had the honor of presenting a writing workshop to the winners of their Young Authors competition. What a creative group! Speaking of winners, today I have the pleasure of announcing the winners of not one, but two Teaching Authors contests. As it turns out, both our winners are teachers--how appropriate for Teacher Appreciation Week! Before I tell you their names, I want to thank everyone for celebrating our First Blogiversary with us. Your response was phenomenal, and we're thrilled to welcome so many new readers. The winner of our First Blogiversary Critique giveaway is Tricia, who blogs at The Miss Rumphius Effect. Tricia is a former middle school teacher who now prepares future teachers. She's going to have to decide between having a critique of her poetry or a nonfiction picture book manuscript. "Bid to win full length manuscript critiques with Tanita Davis, author of the Coretta Scott King Honor Book Mare’s War (Knopf, 2009), Michelle Poploff, Vice President, Executive Editor at Delacorte Press Books for Young Readers, and picture book writer Tanya Lee Stone, who won the Sibert Award for Almost Astronauts: 13 Women Who Dared to Dream (Candlewick, 2009). In addition, National Book Award finalist Deborah Wiles and Jacqueline Kelly, author of Newbery honor book The Evolution of Calpurnia Tate (Henry Holt, 2009), will offer young adult and middle grade manuscript critiques. Bidding ends at midnight EST May 9." Visit Ebay to place your bid. Our second winner is Sandra, a middle-school teacher who has two blogs--one on reading and one on writing. Sandra will receive an autographed copy of Irene Latham's Leaving Gee's Bend. Again, a huge thank-you to all who participated in our two contests. We'll be having another giveaway soon, so please stay tuned. In case you haven't heard, Alice Pope will no longer edit the annual Children's Writer's and Illustrator's Market, so her CWIM blog has come to an end. 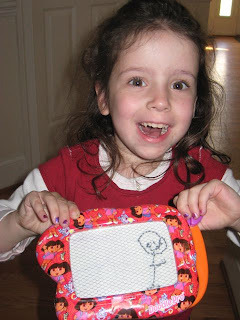 However, the good news is, she will now be blogging for SCBWI at the all new SCBWI Children's Market Blog. I've already added it to my blog reading list! The latest edition of The Prairie Wind, the SCBWI-IL online newsletter, is now online. As usual, it's packed with amazing advice, inspiration, and information. And for all you bloggers, be sure to read Hilary Wagner's article, "Ma’am, Put Down the Laptop and Step Away from the Blog!" I recently had the pleasure of being interviewed on my friend Bruce Black's Wordswimmer Blog. We discussed one of my favorite topics: character names. You can read the interview here. Have you read something online recently that would be of interest to children's writers or those who teach writing? If so, please post a comment with a link. All right I'm not really fishing, although given the amount of rain we've had in my neck of the woods, I could probably fish off my backporch. I am in Winnetka, Illinois for a couple of days of school visits, library programs and a book signing, which is just as much fun as fishing. I hope to see some of you who live in the area. ( http://www.onebooktwovillages.org/kidsummary/?bookid=60741095 ) Tell me you read Teaching Authors so I will know who you are. The next time I write, I hope I will have some pictures and stories to share with you. Remember, you have until 11 pm Tuesday to enter both of our giveaways; the one for Irene Latham's book, Leaving Gee's Bend, the other for the free critique. See Esther's last post for details regarding the book giveaway. And Carmela's post for the critique information.